It's always strange to read that exact statement in the media. I can't count the number of people that have asked me "Is that the new [pick you favorite manufactuer]?" about my NSX. If it's so dated, then why do people always think it's the newest thing? You have just exposed the problem w/ the NSX: Lack of recognizability. Acura needs to go mainstream with this new model if this is to be Acura's flagship (i.e. most expensive) car. Otherwise, Acura needs to kill their supercar segment and continue their focus on building the best front-wheel-drive-entry-level-luxury-sports-sedans. Anyone who asks you if your NSX is the new anything is not very knowledgeable about vehicles and the very question they ask exposes that. All that means is that you keep your car clean. The NSX has a sporty and sleek exotic design, but it is dated. Who will buy a car that will break the bank and look like a car from 1993? I'd certainly opt for a used one, but that's just me. And I don't know why people are getting excited positively or negatively by the HSC design. Remember the CL-X concept in '95? Like every other Honda concept it has promise but I doubt it will look "much" like the HSC. I don't think either side of the design argument will be pleased or disappointed with "the new car to replace the NSX". You have just exposed the problem w/ the NSX: Lack of recognizability. Acura needs to go mainstream with this new model if this is to be Acura's flagship (i.e. most expensive) car. I agree 100% - Acura never marketed the NSX to the point they needed to, and I can only hope they learned from their mistakes with the new HSC. I also it has more than the reported 300 hp; even though the NSX is fast and nimble, it suffers from the image that 290hp isn't enough. Honda prides itself on doing more with less, but that concept doesn't work with 500hp supercars out there. Anyone who asks you if your NSX is the new anything is not very knowledgeable about vehicles and the very question they ask exposes that. No doubt- especially those two women that asked me "Is that the new Camaro?" (seriously). I don't like it the first time I saw it. But the more I look at it, the more I like it. I believe 0-60mhp on this car is under 5sec. With a V6 3.5L car, I think it does well. After all, Honda's spirit is to have the smallest displacment to achive the highest performance, isn't it? Also, 500HP+ supercar is about 3 times more expensive both buying the car and fueling the car, isn't it? I don't think marketing will remedy this "problem". No matter how many NSX commercials or print ads Honda spends their money on, you're just not gonna get a lot of customers for a $90 thousand, two-seat sports car. It's just not for everyone. That being said, I love the NSX in concept and execution (even though I do wish it had a V-8). And I don't think it looks dated at all. The '03 ones look incredible, IMO. I'd buy one in a second if I had that kind dough to spend on a car. No....I'm lying. I'd probably get an M5. NSX is still sweet, though. Location: At a rave near j0o! I like the current one more, this new one is ugly! There's a problem with the NSX? How do you figure? It's one of Acura's longest running models...I figure there is very little wrong with it. It doesn't sell many copies because there isn't a very big market for these kind of cars. If it sold poorly, you wouldn't see it lasting this long. I don't think this redesign is to "save the ailing car" but to evolve an already great car to the next level. Rest assured, the design will be "dumbed" down. The closest concept to production transition honda has ever had was with the MDX, I believe. Think CL-X concept to 3.0 CL. You won't be too disappointed. It could be possible Honda is saving an ailing great car by evolving it. 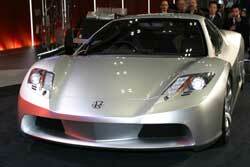 The NSX was used to showcase Honda's newest technology of the time. 12 years later it gets fixed headlights and a standard CD player. No i-VTEC, no CVCC, no VSA, no VTM-4. It's pretty much the same car from 12 years ago. Even if the NSX was doing well, WHICH IT IS NOT, an update to the NSX is long overdue. Sure Honda could settle on building and tweaking a great car that used to be a Ferarri killer (but is now a Corvette-chaser), but then Honda could also choose out-do itself once again** like we all know it can. **Just because 15 pieces of flair is the minimum, doesn't mean you can't wear more. Look at Brian. He has 37 pieces of flair. I just don't think Honda all of a sudden woke up and realized the NSX is not selling. Especially in an economically chaotic time like this if a car isn't selling, they drop it. But NSX sales are only down 2.8% YTD. That's the lowest sales loss of the Acura car line (not including the MDX which isn't a car, and the TSX which wasn't around last year). The NSX will always be a low volume car...they've only sold 200 this year so far and that's the way Acura seems to want it. Just because it's being redesigned, doesn't mean the car is in trouble. Was the new Accord an attempt to save an ailing car? No, the previous gen was still selling 400,000 cars a year. The NSX is not a mass produced car. Its hand builted by Hondas top techs. If they wanted to mass produce it, they easily could have ran the car thru the factory line and dropped the price by 30K. But they didn't...the NSX to this day is still Japans one and only true sports car. Rather its outdated or not, I think we all have our own opinions. Im sure the sports car world are all waiting to see whats under the skin of this 2nd gen NSX. And for those that have never ever driven an NSX please don't comment on the car. Because you have no idea what it feels like behind the wheel. When the Acura NSX was new, it was selling more than 4,500 copies worldwide. Last year it only sold 364. If these numbers don't spell trouble to you, I don't know what else to tell you. And for those that have never ever driven an NSX please don't comment on the car. Because you have no idea what it feels like behind the wheel. This is a bit pompous, don't you think? Under that pretense, only a handful of people in the world could talk about the McLauren F1 or any other exotic. Everybody can comment all they want about the car if they haven't driven it- just don't talk about it's performance as if you've been there. Similarly, I can't talk about how well a McLauren grips the road, but can tell you how great it looks and how many are sold. Comment...I meant about how the car drives...not how the car looks. Looks are subjective anyways. So forgive my comment...Im a diehard NSX fan(98NSXT)...and will probably be first in line for the new one. No, it doesn't spell trouble for me. Honda was selling as many of these cars as they wanted. If they didn't, they would have changed something a long time ago. When did I say this Honda's motivation for change was "all of a sudden"? And the NSX sales are way down since 1992. I don't even need to give numbers, as we all know this. It isn't "in trouble", per say. It was in trouble around 1995. Now the passion for the NSX is more or less dead. Maybe not ith NSX fans, but with exotics fans in general as well as the media. Like I've said before, Honda has to go mainstream with this one with outstanding numbers as well as performance. I just don't see many people going for a 300hp vehicle for 90,000+ in this day in age, but I could be wrong. As for you Accord comment, you kinda helped to make my point about Honda's mentality with the NSX. Think about it. "I just don't see many people going for a 300hp vehicle for 90,000+ in this day in age" That's excactly right. Not many people will...because it's a low volume car. It's not for the masses. I still don't think the car is in trouble. It's highly regarded in the enthusiast community. Actually, I just watched a video about the Ford GT and the reviewer suggested the NSX as one of the car's inspirations. As for the Accord reference, I did think about it...and I don't see how suggesting that a car isn't always redesigned just because it's "in trouble" would help make your point. Honda didn't develop the new Accord because the old one was "in trouble", they did it because it's the next progression of the car. Just as Honda isn't redesigning the NSX because it's "in trouble". They are because it's the next progression of a long running design. And no, I don't think there's a problem with the NSX. Mojo did. You should read more carefully. I don't think there's any problems with it. The only "problem" I can say is that Honda didn't market it as well as it should, although I like the exclusitivity myself. Besides, I wouldn't own one if I thought there were problems- there are certainly other (and more powerful) cars out there for the same money. I am a sucker for the NSX..
"I don't think marketing will remedy this "problem". No matter how many NSX commercials or print ads Honda spends their money on, you're just not gonna get a lot of customers for a $90 thousand, two-seat sports car. It's just not for everyone." You're saying marketing won't "remedy" the problem...so you'd have to admit there's a problem that would need remedying. That's what I read carefully. That's the only reason I quoted you (as an extension of mojo's comment). Excuse me. I meant to say that I just don't see many people in the market for an exotic going for a 300hp vehicle for 90,000+ in this day in age. As for the NSX being an inspiration, that doesn't sound good to me. Its like Michael Jordan being the inspiration for the great players of today. He may go down as the greatest, but he can't compete with the new superstars now. I just find it odd that technology used to trickle down from the NSX, but now its making it way up from the RSX. And I think this whole "exclusivity" thing is overblown. But then again, I'm not rich so I can't afford to pay 90K for what is maybe a 60K value today simply because it is handbuilt and no one else has it. If you want exclusivity, get a Pontiac Aztec. I'm glad that the Acura division is now getting more performance minded and hopefully they show their asses with this new model in terms of performanc and value like the rest of their vehicles. I don't consider the NSX to be an exclusive item - Honda only makes a certain number because they know only a handful will buy them now. They're not doing it on purpose to limit the number of NSXs sold. The NSX is a low volume car, but it's not THAT low volume to only sell a few hundred units a year. I'm sure Honda would be much happier selling 4,500 a year, like they did back in the 90s, rather than the 200 or 300 a year that the NSX is selling at. Exclusive, no. Rare, yes, but only because they are low production (because they don't sell). There have only been around 8500 sold (add ~200/yr for the past 5 years) in the US since it was introduced. I don't think it's the "exclusitivity" as it is rare or unique. I like the fact that I never see another one when I drive around (and the same thing with the TSX for that matter). Maybe that was a bad word choice. ....You're saying marketing won't "remedy" the problem...so you'd have to admit there's a problem that would need remedying. That's what I read carefully. That's the only reason I quoted you (as an extension of mojo's comment). I don't have to admit anything. I was saying that marketing dollars won't affect the NSX's situation or sales because the market for the car isn't big enough. So, it's not really a "problem", it's just a fact of life--you're not gonna sell a bunch of NSXes because of the kind of car it is (that's why I put "problem" in quotes). And then you said that it doesn't sell many copies because there isn't a big market for these kind of cars. If I change, "problem" to "mistake" (mojo's word), will that make you happy? The ultimate Honda is coming to the UK - and the first customer is likely to be one of Britain's best known racing drivers. The flagship NSX Type R, seen here on British soil for the first time, has been shipped over for homologation testing so that Honda's F1 star Jenson Button can drive it on UK roads. Although the car's 276bhp output is unchanged, carbon fibre bodywork, a revised engine and hardened suspension make the Type R a genuine rival to Ferrari's 360 Challenge Stradale. No official announcement has been made, but the green light for the six UK dealers authorised to sell NSXs is expected soon. Several salesmen are rumoured to be taking deposits for the Type R already, even though there will be no deliveries before next spring. A price premium of around £5,000 is expected over the standard NSX, lifting the cost to £65,000. But despite the early interest, Honda does not expect to sell many more than 10 models a year here. Meanwhile, sources in Japan have revealed that the next-generation NSX, which is due for launch in late 2005, will be powered by a mighty 3.6-litre 450bhp version of the current model's V6 powerplant. Now that is supercar territory. Way to go Honda!!! Need more HP.....The C6 will be around that amount for half the price and the Z06 will have a lot more. Needs 500 hp at least. doesn't really need that much, especially n/a. it's a light car, full aluminum body. an nsx now with f/i with approx. 450-500hp runs mid 11's. i think it's great, better than keeping the original 290hp. it's about time. we shall see. who are these "sources"??? and why would such information be leaked from a company known for keeping its HP figures SECRET practically till LAUNCH DAY (2004 TL anyone??) im not going to say that the new NSX, whenever it comes out, wont have 450 HP, god knows it should!..BUT, i think this info is premature and probably bogus. honda wouldnt release this info. To be honest... I dont see how the hell they can get 450hp out of a N/A 3.2L V-6. If BMW gets 360hp out of thier I-6... I fail to see how Honda would get 450hp! I could only see 350hp Max out of the NSX N/A. I disagree. You forget the weight factor, plus it's not all about all out power here. The Modena makes 390 HP and it costs 3.5 times the Z06's price which has more total HP. THis is not "relased info" from Honda. It's unofficial info. The TL is a different story. The Acura brand exists on in N.A. The NSX is sold in Europe too (albeit with a Honda badge). Getting info for a global car is easier than a niche-market car. Too bad it's only a rumor and not a fact though. Time will tell. The article doesn't say that it's NA, so it may be 450bhp twin turbo 3.6. Not very Honda-like, but we'll see. Yeah. So....3.6 liters and 450 HP, that is 125 HP per liter from 6 cylinders. It's gotta turn all the way to 10,000 rpm to get this kind of power from a NA engine. Note: Nowhere in the article is totally obvious that this will be a naturally aspirated engine. It's derived, but not clearly mentioned. I am 99% sure this would be an NA engine, but not 100% sure. Honda/Acura has always been showing the way for more specific power in NA applications. Why not once again? Remember what people thought and said of the S2000's engine when it first came out? They could not believe it. Well...time to repeat. It totally makes sense if so. That's the way to get back to the good old self for Honda. Keep breaking records for brand recognition and image to improve. BMW's M5 engine will be safely turning at 9000 rpm and it has been tested to be OK up to 10,000 rpm for 530HP. That's a 5.5 liter V10 engine. It's way easier to make a V6 turn that fast than a V10. Not impossible at all.